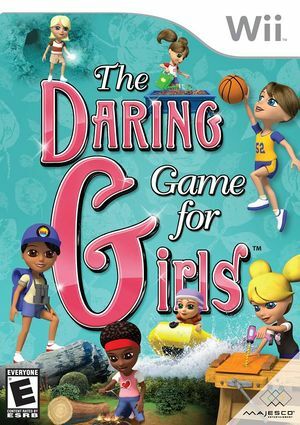 The Daring Game for Girls is an entertaining and informative adventure that lets players virtually experience activities straight from the popular book. Players can pick from one of several character models with a wide range of ethnicities and features. As they play, girls will earn gear and collectibles while having fun in spy missions, cave exploration, freeze tag, double dutch, basketball, arts and crafts, managing a corner stand, making friends, and much more. Players will also learn educational facts about famous women in history and use that knowledge to ace Pop Quizzes. Only by earning all six types of Daring Girl Badges - including Girl Lore, Life Skills and World Knowledge - can players realize an adventure to Africa, the Amazon or Mt. McKinley and become a true Daring Girl! Two invalid read errors occur after the initial Wii Remote safety warning and then the game hangs. Refer issue 10821. The graph below charts the compatibility with The Daring Game for Girls since Dolphin's 2.0 release, listing revisions only where a compatibility change occurred. This page was last edited on 24 January 2018, at 02:38.